As a global company with offices across Europe, North America and our headquarters in Israel we like to use every opportunity to come together as a group to share feedback and discuss ideas for future success. We arrived in Eilat and before checking into our hotel we were into the first meeting of the week. Yaacov Cohen, CEO of harmon.ie presented his annual “State of harmon.ie” address, covering the previous year in numbers. The opening session celebrated the success of 2018, including some of the big deals that were successfully won in 2018—including a large-scale partnership with German engineering and electronics giant, Bosch, as well as the employee buyout of the company earlier in the year. In addition to looking back at 2018, we looked toward the new year and where we want to be as an organization. Where our company is going has to do with topic computing and our flagship product, harmon.ie 10. In his opening session, Yaacov put forth the roadmap for the release of harmon.ie 10, the first app to use the Microsoft Graph and Natural Language Processing (NLP) to bring vital information directly to users. The Microsoft Graph helps organizations work better by collating the data users generate across Office 365. harmon.ie takes the power of the Microsoft Graph to connect users to their work in a place where they will see it: their Outlook client. Harmon.ie 7, released in preview from January, will run on the Microsoft Graph and will be our Topics Early Access product where organizations can sign up to test out our cutting-edge solution. harmon.ie 7 general availability is coming in March and harmon.ie 10 GA will be available in July. In conjunction with the forthcoming product release, Yaacov also covered, at the Partner summit, the main company objectives and the direction, plans and messaging for the year ahead. In the afternoon, we broke out into our various department groups—sales, marketing, IT, etc.—and workshopped different ways we could set measurable goals to ensure we, as a company, achieve these objectives. After a day of travel and meetings, some of us decided to relax before the inaugural harmon.ie Partners Gala. Others partook in the annual five-on-five football/soccer game that brings harmon.ie employees and partners from all over the world together to show off their skills and win bragging rights for the year. Then it was on to the trendy Eilat club, 5th Avenue and the sumptuous feast of food, dancing and company shares as we celebrated the future of harmon.ie together. On Day 2 we cleared away the cobwebs with a hike in the beautiful Timna Valley region about an hour from Eilat. Here, in the vast expanse of copper mines that date back to the reign of King Solomon, we marched across rocks and cliff-faces, admiring the landscape while taking care to survive it. The day centered around teamwork, including several non-verbal communication exercises, a bike ride down to the resort front, and building and designing a monument to our values. The day was about working together, communication, creativity and stamina! All ideals that we think helps make us the organization we are. On our third and fourth day of the Partner summit 2019, team bonding and celebration turned to the serious business of getting ready for the coming year. We opened with a presentation from Ran Shribman, VP of Sales, showcasing 2019’s key initiatives, including the importance of our harmon.ie Early Access Program and Customer Success Program. Ran covered the new email management playbook and our focus on specific verticals to emphasize in 2019. These sales and marketing lookaheads were followed with a comprehensive look into how the harmon.ie Topic Engine works, giving partners some insight into the new technology. The Topic Engine is how harmon.ie is differentiating ourselves from our competitors in 2019. So, expect to see plenty of content on our blog showcasing the power of harmon.ie with NLP and Microsoft Graph technology when it comes to helping knowledge workers be more efficient and productive. 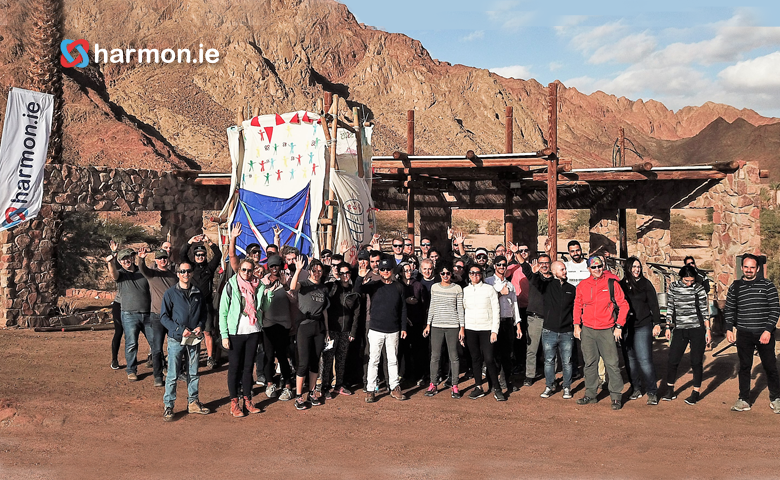 And lookout for us in 2019 where we’ll be putting into practice everything we’ve learned from our four days in Eilat! If you’d like to find out more about our vision for 2019 and how our solution can enable business productivity rather than complicate it, contact us today.